In spite of a hike in the prices of essential goods worldwide, the city’s economy is flourishing, Mr. Nguyen Trung Tin, vice chairman of the city’s People’s Committee, told a meeting Thursday called to implement measures to restrain inflation. The meeting was convened by Mr. Le Hoang Quan, chairman of the city’s People’s Committee, in response to a call by Prime Minister Nguyen Tan Dung on April 2 to mobilize the entire machinery of the state to take drastic action to curb inflation and strive for sustainable growth. The meeting was attended by representatives of state-run companies and private companies. The city’s industrial sector has grown by 13.7 percent compared since 2007, turnover in the service sector has increased by 19.4 percent, and export earnings have increased by 12 – 17 percent, Mr. Tin said. In first five months of the year, the government collected tax revenue of VND52 trillion (US$3.2 billion), 50 percent of the entire amount that had been projected for 2008. The People’s Committee is expected to increase the city’s budget by 5-10 percent. Director of Saigontourist Nguyen Huu Tho said that his company has seen an increase in profit, over VND1 trillion in the first five months 2008. The Saigon Jewelry Company has earned VND21.3 trillion, although the price of gold has increased. The company planned to manufacture 70 tons of ingots for the whole year. However, 56 tons have already been produced. There is also growth in the agriculture, printing and garment sectors ensuring permanent employment. Nevertheless, the city is encountering some challenges. These include unpredictable oil prices, higher bank interest rates, and entrepreneurs having difficulty in applying for a loan and a hike in scarce building materials that has led to a halt in new projects. 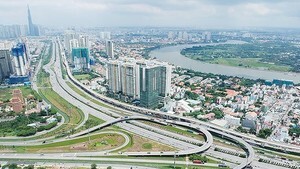 Director of the Saigon Trading Group Huynh Van Minh noted that his company’s must stop several building projects and that its sub-divisions are also facing some difficulties. The price of materials for manufacture is higher than for finished goods. The dollar/dong exchange rate has been a problem for exporters. According to a representative from Gia Dinh Garment Group, its turnover in the first four months rose by VND542 billion (US$33 million), a 7 per cent increase and the company’s earnings increased only by VND12 billion (US$740,000). This happened because contracts were signed in 2007, but the price of materials has soared 20 percent in first five months of this year. In addition, company had raised salaries. Deputy Chairman of the Ho Chi Minh City People’s Committee Nguyen Thi Hong asked businessmen to take measures to curb price hikes by expanding there retail networks, cooperating with their partners as well as with bank leaders to provide capital for enterprises.